Astronomers announced Wednesday that they had captured the first image of a black hole. The Times’s Dennis Overbye answers readers’ questions. When radio waves from the depths of a nearby galaxy known as Messier 87 traveled some 55 million light-years to a constellation of telescopes on Earth, revealing to humanity the face of a black hole for the first time, people around the planet paused in wonder. Why does it look like a doughnut? How scary is it when two of these things smash into each other? And if light can’t escape a black hole, what are we even looking at? Our coverage Wednesday of the first ever image of a black hole, by our cosmic reporter Dennis Overbye, drew a huge response from our readers. Dennis graduated from M.I.T. with a physics degree and was a Pulitzer Prize finalist in 2014 for his coverage for The New York Times of the race to find the Higgs boson. He sat down Thursday with his feet on his desk, beside a photo of the black hole, to answer some of our readers’ questions and respond to their feedback. Below are some of the exchanges that he had during an AMA on Reddit and in the comments on his article. They are edited for clarity. What does this image really tell us besides black holes are round? This is the first look into the central engine that generates the enormous energies put out by quasars, radio galaxies and other so-called active galactic nuclei. The action all starts down at the edge of oblivion, in a maelstrom of hot gas, gravity, magnetic fields and otherworldly pressures. It extends out beyond the far reaches of the galaxy, as jets of radio-wave energy moving at nearly the speed of light; these lobes of radio energy can accompany shock waves capable of blowing the gas out of galaxies or even entire clusters of them, preventing stars from forming. Through these mechanisms, black holes, blowing hot and cold, control the growth and structure of galaxies. It all starts in the accretion disk, the doughnut of doom. Why does it look like a “doughnut of doom” and not a sphere? When matter falls together into a black hole, or in almost any other situation, it has angular momentum, and takes on the shape of a flattened pancake spinning around the central attraction. Also, the black hole is probably spinning, pulling the disk around in the same direction. We are seeing the disk almost directly face-on, so it looks like a doughnut hole. (From edge-on it would look different.) Bent by gravity, light wraps around the hole on its way to our eyes, so the black hole magnifies and distorts the image of the accretion disk. Will we ever get a clearer image of this black hole? We will. The key is to observe black holes at shorter and shorter radio wavelengths, which allows more and more detail to be resolved. The latest images were recorded at a wavelength of 1.3 millimeters in the microwave band. The Event Horizon team hopes to go to shorter wavelengths in the future, and to use more antennas, including one in space, which would increase the size of their “virtual telescope” and also increase resolution. Do you feel that coverage of the breakthrough minimized the role of Katherine Bouman, a researcher at the Harvard-Smithsonian Center for Astrophysics? The issue of the unsung hero or heroine is a big problem, especially in Big Science, which the Event Horizon Telescope is surely part of. There were 207 people in the collaboration, according to one of the physicists I talked to that day. I am sure that many crucial contributions and rich anecdotes of behind-the-scenes science got missed. In time, these will come out in more thoughtful, longer narratives. On the day of the announcement there was a tsunami of information released at 9 a.m., and a rush to post stories as soon as possible, an unfortunate fact of the internet age. What does current science tell us is supposed to happen in the gravitational extremes of a black hole? That’s the biggie everybody wants to know. Whatever happens there, it probably is similar to what happened, maybe in reverse, in the Big Bang. Space, time, matter all go away, replaced by what? Some people think the answers might come from string theory, which unites gravity with quantum theory. But for now it remains an untestable, but mathematically elegant, speculation. Such collisions have happened and been recorded by the LIGO gravitational wave observatory. They vibrated the space-time continuum like a drum and released as much energy in a fraction of a second as all the stars in the observable universe. The result in each case was an even bigger, blended black hole. But outside the event horizon, the gravitational field of a black hole is just like that of a star and it is no more dangerous. Black holes don’t go roaming around looking to swallow you. They only hurt if you touch them, in which case you won’t ever be able to let go. Otherwise they are like any other animal that you would just let go, and mind your own business. How is any of this relevant to our day-to-day lives? It can certainly provide context to your daily life, but it won’t move the markets. It will, or could, move your soul. However, Einstein, when he invented the sort of trampoline universe described by general relativity, did not dream that it would lead to pocket devices that keep time and tell you precisely where you are on Earth — that is to say, GPS. But they depend crucially on general relativity to tell you where you are. So who knows? FIRST LOOK: The Event Horizon Telescope measures wavelength in the millimeter regime, too long to be seen by eye, but ideally suited to the task of imaging a black hole: The gas surrounding the black hole is almost transparent at this wavelength and the light travels to Earth almost undisturbed. Since we cannot see light of such wavelength by eye, the released telescope image shows the observed signal shifted into the visible range.Event Horizon Telescope Collaboration. 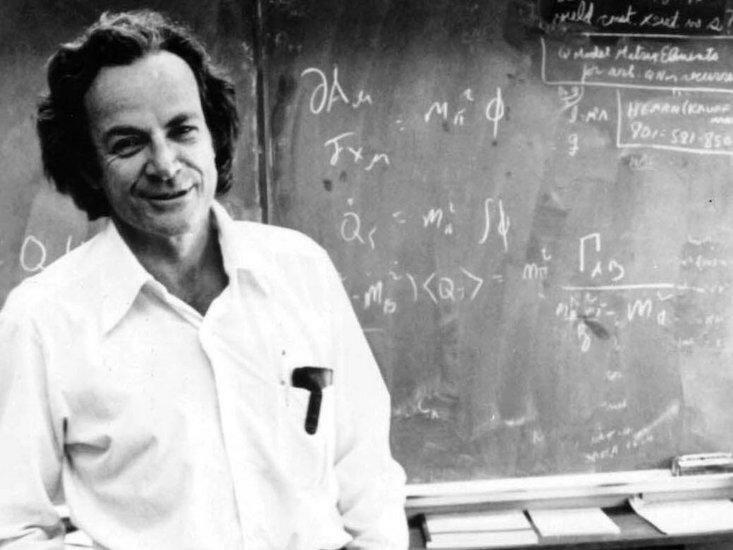 After a few minutes, Richard Feynman had worked out the process of spontaneous emission, which is what Stephen Hawking became famous for a year later.Wikicommons. The Italian 14th-century painter, Giotto di Bondone, when asked by the Pope to prove his talent, is said to have swung his arm and drawn a perfect circle. But geometric perfection is limited by the medium. Inspect a canvas closely enough, and every circle will eventually appear grainy. If perfection is what you seek, don’t look at man-made art, look at the sky. More precisely, look at a black hole. Looking at a black hole is what the Event Horizon Telescope has done for the past 12 years. Yesterday, the collaboration released the long-awaited results from its first full run in April 2017. Contrary to expectation, their inaugural image is not, as many expected, Sagittarius A*, the black hole at the center of the Milky Way. Instead, it is the supermassive black hole in the elliptic galaxy Messier 87, about 55 million light-years from here. This black hole weighs in at 6.5 billion times the mass of our sun, and is considerably larger than the black hole in our own galaxy [1,000 times the size of SGR A*]. So, even though the Messier 87 black hole is a thousand times farther away than Sagittarius A*, it still appears half the size in the sky. In theory, black holes are regions of space where the gravitational pull is so large that everything, including light, becomes trapped for eternity. The surface of the trapping region is called the “event horizon.” It has no substance; it is a property of space itself. In the simplest case, the event horizon is a sphere—a perfect sphere, made of nothing. In reality, it’s complicated. Astrophysicists have had evidence for the existence of black holes since the 1990s, but so far all observations have been indirect—inferred from the motion of visible stars and gas, leaving doubt as to whether the dark object really possesses the defining event horizon. It turned out difficult to actually see a black hole. Trouble is, they’re black. They trap light. And while Stephen Hawking proved that black holes must emit radiation due to quantum effects, this quantum glow is far too feeble to observe. But much like the prisoners in Plato’s cave, we can see black holes by observing the shadows they cast. Black holes attract gas from their environment. This gas collects in a spinning disk, and heats up as it spirals into the event horizon, pushing around electric charges. This gives rise to strong magnetic fields that can create a “jet,” a narrow, directed stream of particles leaving the black hole at almost the speed of light. But whatever strays too close to the event horizon falls in and vanishes without a trace. At the same time black holes bend rays of light, bend them so strongly, indeed, that looking at the front of a black hole, we can see part of the disk behind it. The light that just about manages to escape reveals what happens nearby the horizon. 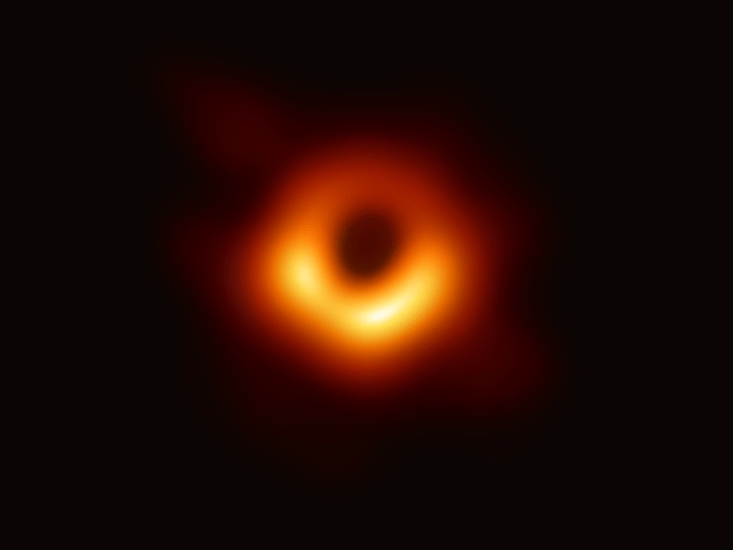 It is an asymmetric image that the astrophysicists expect, brighter on the side of the black hole where the material surrounding it moves toward us, and darker where it moves away from us. The hot gas combined with the gravitational lensing creates the unique observable signature that the EHT looks out for. The experimental challenge is formidable. The network’s telescopes must synchronize their data-taking using atomic clocks. Weather conditions must be favorable at all locations simultaneously. Once recorded, the amount of data is so staggeringly large, it must be shipped on hard disks to central locations for processing. The theoretical challenges are not any lesser. Black holes bend light so much that it can wrap around the horizon multiple times. The resulting image is too complicated to capture in simple equations. Though the math had been known since the 1920s, it wasn’t until 1978 that physicists got a first glimpse of what a black hole would actually look like. In that year, the French astrophysicist Jean-Pierre Luminet programmed the calculation on an IBM 7040 using punchcards. He drew the image by hand. Today, astrophysicists use computers many times more powerful to predict the accretion of gas onto the black hole and how the light bends before reaching us. Still, the partly turbulent motion of the gas, the electric and magnetic fields created by it, and the intricacies of the particle’s interactions are not fully understood. The EHT’s observations agree with expectation. But this result is more than just another triumph of Einstein’s theory of general relativity. It is also a triumph of the astronomers’ resourcefulness. They joined hands and brains to achieve what they could not have done separately. And while their measurement settles a long-standing question—yes, black holes really do have event horizons!—it is also the start of further exploration. Physicists hope that the observations will help them understand better the extreme conditions in the accretion disk, the role of magnetic fields in jet formation, and the way supermassive black holes affect galaxy formation. When the Pope received Giotto’s circle, it was not the image itself that impressed him. It was the courtier’s report that the artist produced it without the aid of a compass. This first image of a black hole, too, is remarkable not so much for its appearance, but for its origin. A black sphere, spanning 40 billion kilometers, drawn on a background of hot gas by the greatest artist of all: Nature herself. ESO, ALMA, and APEX contribute to paradigm-shifting observations of the gargantuan black hole at the heart of the galaxy Messier 87. BlackHoleCam is an EU-funded project to image, measure and understand astrophysical black holes. The main goal of BlackHoleCam and the Event Horizon Telescope (EHT) is to make the first ever images of the billion solar masses black hole in the nearby galaxy Messier 87 and of its smaller cousin, Sagittarius A*, the supermassive black hole at the centre of our Milky Way. This allows the determination of the deformation of spacetime caused by a black hole with extreme precision. Observing the core of Messier 87, HST-1 galaxy. Messier 87 image with WFC3 HST (2016) with F814W filter. different knots are seen along the jet, including the first node HST-1. Credit: NASA/ESA Hubble. The study by two researchers from Instituto de Astrofísica reveals that the shift observed in the nucleus of the galaxy Messier 87 is not due to a shift of its massive black hole, but variations in light production in the center of the galaxy caused by bursts from a jet, a flow of material relativistic beam as the hole itself emits. Today it is assumed that all massive galaxies contain a supermassive black hole (SMBH, for its acronym in English) at its core. In recent years galaxies are looking for candidates to present a SMBHs displaced from its equilibrium position. Among the scenarios that can cause this displacement are merging two SMBHs or the existence of a binary system SMBHs, which gives information about galactic evolution and formation frequency and fusion of such objects. One of the galaxies candidates to present a displaced SMBHs is the giant elliptical Messier 87, containing one of the closest and best-studied active galaxy nuclei (AGN, for its acronym in English). Previous research SMBHs displacement of Messier 87 gave very different results, which was confusing. However, a new study by the student of the University of La Laguna (ULL), Elena López Navas has provided new data suggesting that the SMBHs of this galaxy is in its equilibrium position and shifts found must be variations in the production center or photocentric light caused by bursts from the relativistic jet, a flow of matter that the hole itself expelled outside at speeds near that of light. Research has been necessary to analyze a large number of high-resolution images of Messier 87 taken at different times and with different instruments installed on the Hubble Space Telescope (HST) and the Very Large Telescope (VLT). knot jet, HST-1. Credit: Elena Lopez. 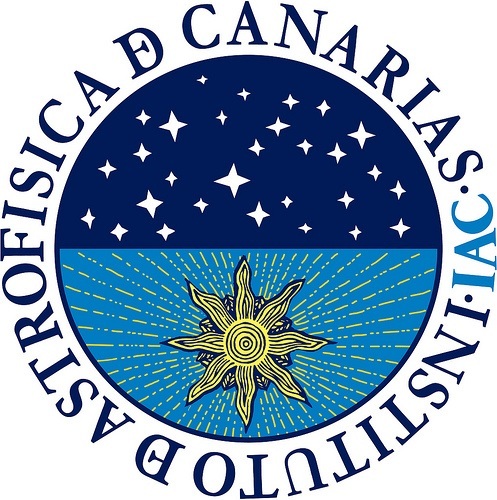 “In our work we have found that the SMBHs is in a stable over the last 20 years position; On the contrary, what changes is the production center of light or Fotocentro “says Lopez, author of this study, as work Master’s Research in Astrophysics, which has just been published in the journal <em>Monthly Notices of the Royal Astronomical Society</em> (MNRAS). The new data have caused great interest among the astrophysics community, as the study SMBHs position of M87 is crucial to understanding the evolution of this galaxy and analysis of other AGN jets. “In addition, this research reminds us that we must be cautious when considering variables sources with irregularities such as, in this case, a huge jet,” says Lopez, who is currently conducting a training grant in astrophysical research at the IAC. Work Master Thesis: E. Lopez Navas (2018 ULL), “Measurement and analysis of the displacement between the Fotocentro and the supermassive black hole in M87“. Please welcome to the stage a master illusionist. An energy beam that stabs out of galaxy Messier 87 like a toothpick in a cocktail olive is pulling off the ultimate magic trick: seeming to move faster than the speed of light [always means speed of light in a vacuum]. Almost five times faster, in fact, as measured by the Hubble Space Telescope. This feat was first observed in 1995 in galaxy Messier 87, and has been seen in many other galaxies since. It might have you questioning your entire reality. Nothing can break the cosmic speed limit, right? You can’t just flaunt the laws of physics… can you? 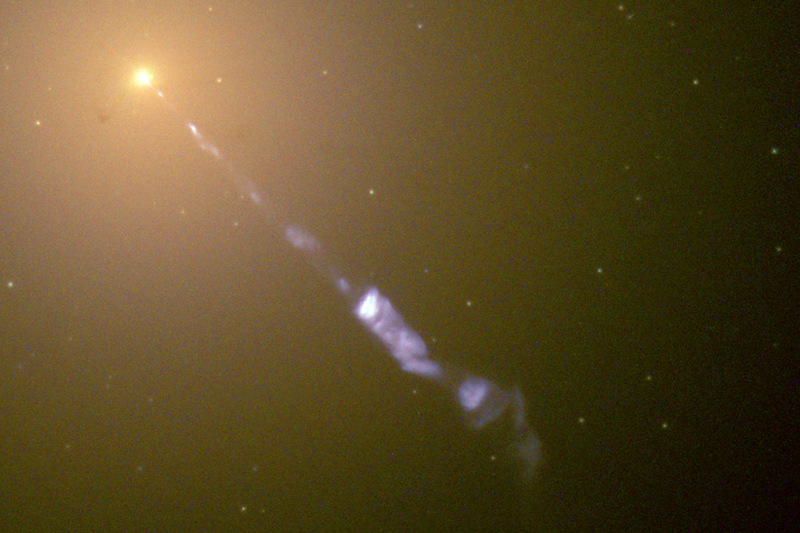 We’ve known about the jet of plasma shooting from the core of Messier 87 since 1918, when astronomer Heber Curtis saw a ray of light connected to the galaxy. To be visible from so far away, it had to be huge – about 6000 light years long. As modern astronomers now know, pretty much all galaxies have a central black hole that periodically draws in stars and gas clouds. When gas begins to swirl down the drain, it heats up and magnetic fields focus some of it into jets of hot plasma. These jets shoot out at velocities near to – but not faster than – the speed of light. If you were to aim a telescope into the sky towards Messier 87, you would see that this lance of plasma is askew. Instead of pointing exactly into our line of sight, it’s angled a bit to the right. The jet from Messier 87 is more than just a curiosity, says Eileen Meyer at the University of Maryland, Baltimore County. By appearing to move faster than light, jets such as the Messier 87 one change visibly over just a few years, which is unusual for distant objects like galaxies. That allows astronomers to make precise estimates of how fast the plasma is moving and thus how powerful the process is. Messier 87 is special because it is relatively close compared to other galaxies, making it easy to study. In 1999, astronomers used Hubble pictures of the jet taken over four years to see that plasma ripple outwards. In 2013, Meyer lengthened that to 13 years of images, which seemed to show that the plasma might also be moving in corkscrew-like spirals – as if it wasn’t complicated enough.